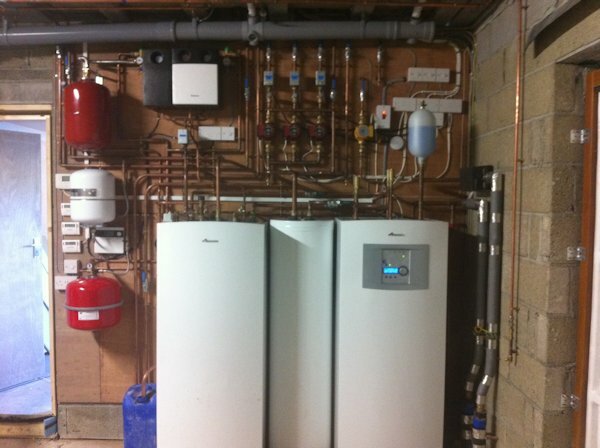 Air to water heat pumps make use of the latent energy from outside air by converting it into heat that can be used with a typical wet heating and hot water system. The heat pumps use the constant energy from the air with a refrigerant circuit to boot temperatures for the provision of heating or hot water. The refrigerant meets the outdoor air in the evaporator (heat exchanger) of the outdoor unit. The air is drawn through by a fan on top of the heat pump. The liquid refrigerant absorbs free energy from the air and evaporates in the process, being led into the compressor. Here, the pressure is increased and the vapour. Air to Water Heat Pumps qualify for Domestic RHI payments, paid quarterly over a period of seven years from the installation date. Both the manufacturer's appliance and the installing company need to be MCS registered and an Energy Performance Certificate (EPC will be required for your property. - Please see News for current tariff rates. An air to air heat pump is an all-in-one heating and cooling system designed for year round comfort. The installation is relatively simple and cost effective, suitable for a wide variety of property types and sizes and will reduce heating bills. This is to say how chuffed we both are with the central heating. Your lads who did the job were a really cheerful bunch and the whole contract was carried out in a totally professional way. A really tidy job. I would like to take this opportunity to commend you and your staff for your prompt service and excellent standard of workmanship and have no hesitation in recommending your services in future. We are very pleased with the way the installation of the (solar) panels was carried out and the standard of workmanship has attracted considerable favourable attention locally.